In primates (both humans and nonhuman primates), much of the brain volume (up to 80%) is occupied by connections between different parts of the cerebral cortex. The specificity of these connections forms information processing networks that are critical to normal sensory, motor, and cognitive function. There are now largescale projects (termed connectome projects) underway worldwide to study this connection machine (humanconnectomeproject.org, brainnetome.org, mouseconnectome.org). However, one aspect of these connectome studies that has largely been neglected is the fact that in humans and in primates, cerebral cortex is composed of basic functional columnar units. These units are on the order of a few hundred microns in size and have specific functions. In this talk, we summarize our development of systematic mapping methods to study connection patterns between sets of cortical columns, thereby producing a functionally based 'columnar connectome'. Dr. Anna Wang Roe obtained her B.A. degree from Harvard University (1984) and her Ph.D. from MIT (1991). Her doctoral work on the 'rewired ferret' preparation is a well-known paradigm for studying brain development and plasticity. Her postdoctoral studies were conducted at Rockefeller University, Baylor College of Medicine and University of Queensland in Australia (under Nobel Laureate Dr. Torsten Wiesel, Dr. Dan Ts'o, Dr. Jack Pettigrew). She joined the faculty at Yale University in 1996 and then Vanderbilt University in 2003. She established new neuroimaging (fMRI, optical imaging, electrophysiology, anatomy) and neurotechnological (optogenetics, near infrared laser stimulation) approaches for studying the organization and function of the cerebral cortex in nonhuman primates. She is recipient of the Packard, Sloan, and Whitehall awards and is a AAAS Fellow and Chinese 1000 Talents Faculty. She serves on NIH review committees and has multiple editorial roles for leading journals. She has published extensively in high impact journals and holds neurotechnology patents. 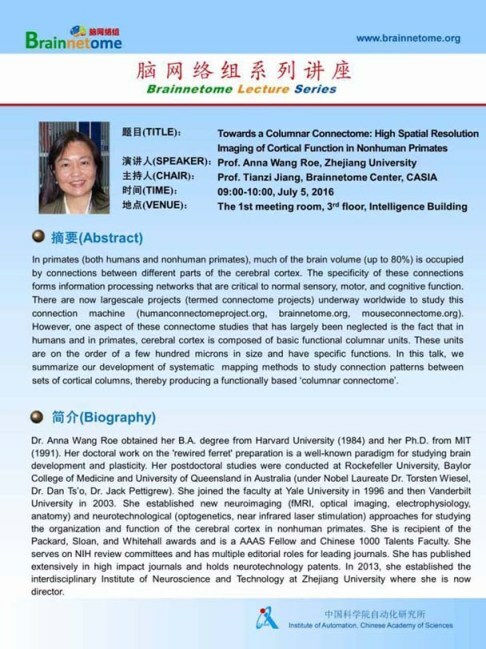 In 2013, she established the interdisciplinary Institute of Neuroscience and Technology at Zhejiang University where she is now director.